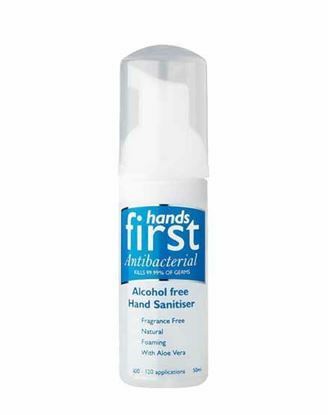 HANDS FIRST is an Antibacterial, Alcohol free instant hand sanitiser. It is a quick, efficient and easy way to sanitise hands without the need for soap, water or towel. Simply apply one pump foaming mousse shot to hands and rub together until dry (10 seconds). Hand Hygiene is commonly recognized as the single most important way of preventing the spread of germs, bacteria and sickness. Washing hands thoroughly with soap and water is the most common way to sanitise hands, however soap and water are not always readily available and can also be very time consuming. Hands First is an Antibacterial, Alcohol free, Water-less Hand Sanitiser. It is a quick, efficient and easy way to sanitise hands without the need for soap, water or towel. Simply apply one pump to hands and rub together until dry (10 secs). Hands First is Laboratory proven to kill 99.99% of germs. Hands First is also fragrance free, so it leaves no smell on your hands, won't taint food and is suitable for the most sensitive skin, it also contains moisturising Aloe Vera and will not dry out your skin. Hands First uses a unique foaming pump which delivers an easy to use metered amount that also makes it last more than two times longer than a gel sanitiser of the same volume. It can be used as often as you like with none of the side effects that are associated with regular use of an Alcohol based sanitiser, i.e. skin irritation and dryness. Hands First has been designed to be used where sanitising is required multiple times a day. Being alcohol free it will not tarnish your jewellery, so be aware of bracelets that hang down into the palm of your hand and your rings. It will not take the shine off your manicure either so you can sanitise properly every time. These are great reasons why you should make the change from your current hand cleaner to Hands First Alcohol Free Hand Sanitiser.